Fragile and even curmudgeonly songs that will make you feel better about life. 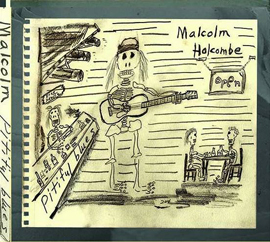 To some degree Malcolm Holcombe from Carolina, defies description as he looks like a penniless hobo and sings poetic songs in a slurred voice of a life well lived; but these songs make his contemporaries sound barely literate. Apart from possibly Guy Clark the nearest singer-songwriter that bares comparison would be Townes Van Zandt; and I don’t choose those two names lightly. The album opens with the title track ‘Pitiful Blues’ and the first time it ended I let out a satisfied sigh and smiled a smile that told the world this was going to be a classy album. Holcombe and Jared Tyler’ production is warm and clear throughout; but on this track they especially bring out the idiosyncrasies in Malcolm’s voice and intricate acoustic picking alongside some picturesque sweeping electric guitar breaks. ‘Savannah Blues’ conjures up Ansel Adams monotone landscapes every time I hear it; as Holcombe describes his aching bones, the undertakers moon and a powerful rainstorm so narratively you feel like you are standing next to his graveside as they lower his box into the ground. On ‘Another Despair’ the tempo picks up but the mood doesn’t as Holcombe stomps his foot angrily to a tight Rockabilly beat, that Dale Watson would be proud of. The raw ‘Words Not Spoken’ virtually took my breath away first time I heard it and continues to have a similar effect three weeks later; and goes to show a minimal approach in Holcombe’s own backyard studio can have a more lasting effect on a song than a thousand overdubs in a hundred times more sophisticated studio. On an album that is very nearly faultless it’s difficult to pick out a favourite track; but if I still had my radio show I would play ‘The Music Plays On’ over and over again; until my listeners admitted defeat and bought this album. For what it’s worth I think this should have been the title track; but what do I know? Malcolm Holcombe’s tenth and possibly finest album, PITIFUL BLUES ends with the slow and beautiful ‘For the Love of a Child’ which will touch a nerve with parents and Grandparents alike all over the world.